The emerging market opportunity for tablets has been flying under the radar mainly because the device brands aren’t household names and there are concerns regarding the sustainability of the market. Shipments of tablet PCs are expected to grow from 72.7 million units in 2011 to 383.3 million units by 2017, according to the latest NPD DisplaySearch Tablet Quarterly report. Driving the demand is the continued solid growth in mature markets complemented by increasingly strong growth in emerging markets. Emerging markets are expected to account for up to 46% of worldwide shipments by 2017, an increase from the 36% share in 2011. The introduction of tablets from new brands, such as Aakash in India, and established brands, such as Dell in China, is boosting competition and adoption. Penetration rates of tablet PCs in China and Asia Pacific are leading the emerging market regions, but Brazil, India, Russia and other countries are becoming bigger forces on the worldwide scene as prices come down and distribution channels expand. Additionally as counties such as Turkey move to overhaul its entire education systems through efforts such as their FATIH project, Tablet PCs are also taking on a bigger role outside of the home as well. In addition to broader market opportunities driving growth, evolution of the tablet platform will also increase growth. That evolution is expected to initially take the form of higher pixel densities and, in the later years of the forecast, higher performance to enable richer multimedia experiences. In the coming quarters, resolutions and pixel densities will increase in panels, resulting in market segmentation of premium and value categories. 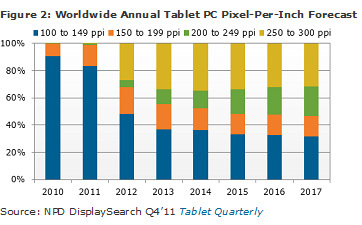 Pixel densities of 200-300 ppi are forecast to rise in 30% of units in 2012 to 47.5% by 2017. Survey results of U.S. commercial tablet owners indicate 39% of respondents said having a Windows OS option as part of their next tablet purchase was important to very important. Touch technology penetration is dominated by projected capacitive with over 80% share in 2011, which is expected to continue and grow to nearly 95% share in 2017. Competing touch technologies, including resistive, combo, and on-cell, will have limited opportunities in tablet PCs. Many display manufacturers are transitioning tablet panel production to larger plants, Gen 6 and Gen 8, which will lead to greater capacity for tablet displays and lower prices. For more information on this report, please contact Charles Camaroto at 1.888.436.7673 or 1.516.625.2452, or contact(at)displaysearch(dot)com or contact your regional NPD DisplaySearch office in China, Japan, Korea or Taiwan. The NPD Group is the leading provider of reliable and comprehensive consumer and retail information for a wide range of industries. Today, more than 1,800 manufacturers, retailers, and service companies rely on NPD to help them drive critical business decisions at the global, national, and local market levels. NPD helps our clients to identify new business opportunities and guide product development, marketing, sales, merchandising, and other functions. Information is available for the following industry sectors: automotive, beauty, commercial technology, consumer technology, entertainment, fashion, food and beverage, foodservice, home, office supplies, software, sports, toys, and wireless. For more information, contact us or visit http://www.npd.com and http://www.npdgroupblog.com. Follow us on Twitter at @npdtech and @npdgroup. Media interested in The NPD Group's Point of Sale data can contact Sarah Bogaty at sarah(dot)bogaty(at)npd(dot)com or 516-625-2357.